She might be 10 years old, but Wild Oats XI reaffirmed her status as Australia’s supreme ocean-racing yacht by fending off a late charge by the brand-new American raider Comanche to win a record eighth line honors title Sunday afternoon. 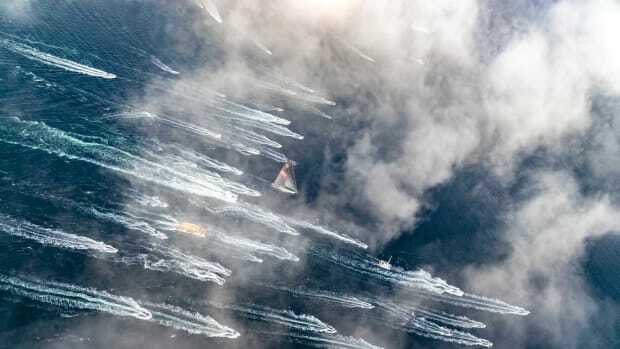 The supermaxi, owned by Australian millionaire Bob Oatley, had to chase to take the lead from Comanche, built at Hodgdon Yachts in Maine, late on Saturday morning. But once she was in front she continued to the finish at Constitution Dock in Hobart on the Australian island of Tasmania. Wild Oats XI crossed the finish line at 3.03 p.m. with an unofficial winning time of two days, two hours and three minutes — outside her 2012 race record of one day, 18 hours, 23 minutes and 12 seconds. Click here for a video recap.